Can an LED Headlight Bulb Make Auxiliary Lights Redundant?   ADV Products  ADV Bike Accessories  Can an LED Headlight Bulb Make Auxiliary Lights Redundant?  A simple headlight bulb swap is all you really need to get ultra-bright lighting. We swap the stock KTM 1190 Adventure headlight bulbs for a pair of Cyclops LED headlight bulbs to see if ultra-bright off-road lighting can be achieved without the hassle of auxiliary lights. It’s not uncommon to hear some adventure riders proclaim you should “never” ride off-road at night. That may be sound advice if you are riding in unfamiliar territory on a motorcycle with stock lighting, but if you never ride off-road at night, you are missing out on one of the most thrilling aspects of adventure riding. When done right, riding at night in the wilderness can be a surreal experience not to be missed. The night transforms the forest into a place of eerie shadows and ghostly figures that puts your senses on full alert. Trails you’ve traveled on many times before suddenly appear unfamiliar without visual landmarks or the horizon to aid in measuring distances. 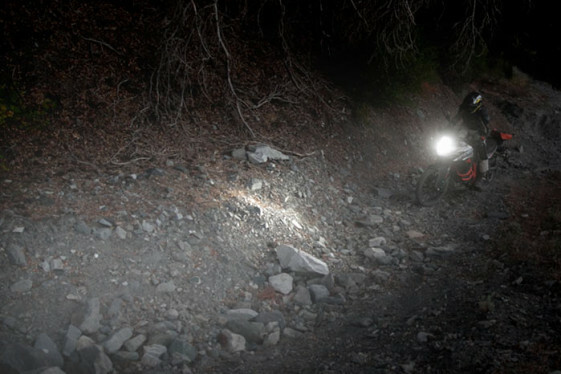 Having good lighting can make all the difference between a scary night ride and an exhilarating one. Powerful auxiliary lights are able to illuminate hidden obstacles in the trail to give you greater confidence at night, allowing you to travel at a more lively pace. But a good pair of auxiliary lights can set you back three hundred dollars or more, and the installation and wiring can get complicated. There’s also the additional draw on your charging system and protruding aux lights are susceptible to trail damage as well. Night riding off-road can be a surreal experience not to be missed when you’ve got good lighting. An increasingly popular way to improve your off-road lighting is to upgrade your stock headlight bulbs to high-output LED headlight bulbs. LED bulbs don’t use a filament like Halogen or HID bulbs, so they are more resistant to the shock and vibration experienced during off-road riding. Installation is typically much easier than auxiliary lights and replacing halogen headlight bulbs with LED headlight bulbs actually reduces the power draw on your charging system. A simple bulb swap keeps everything streamlined on the motorcycle and there is no extra weight added. 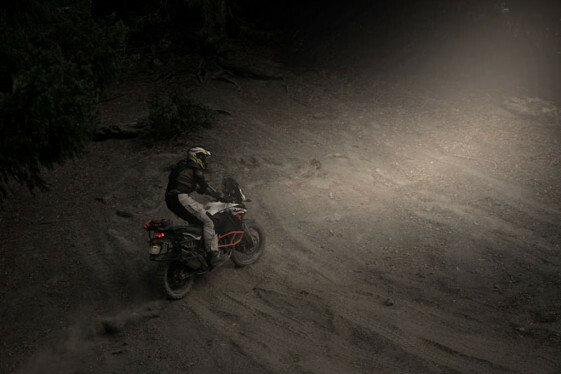 Last year we tried out a 3600 lumen LED headlight bulb from Cyclops Adventure Sports on our KTM 990 Adventure test bike. The improvement over the stock 60-watt halogen bulb was impressive and we were surprised with how well it improved our confidence during nighttime trail rides. 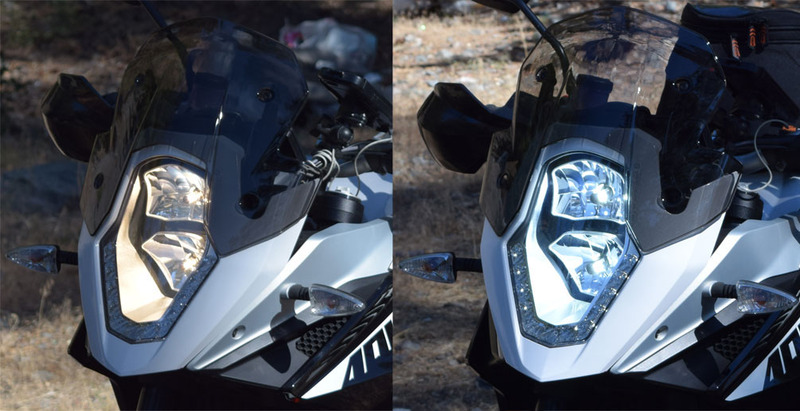 So we were eager to see how much of an improvement we could get with the KTM 1190 Adventure by upgrading its twin halogen headlight bulbs with the Cyclops H11 LED Headlight Bulbs Replacement Kit that produce a total of 6400 lumen light output! 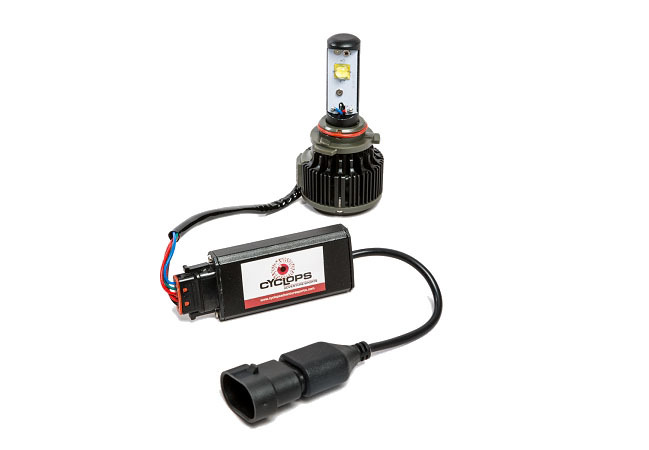 Cyclops H11 LED headlight bulbs are fan-cooled and utilize high-quality Cree emitters to provide 30,000 hours of life. That’s the equivalent of riding 1.8 million miles at 60 mph, so they are likely to outlast your motorcycle. When we received our KTM 1190 Adventure H11 LED headlight bulbs from Cyclops, we noticed the kit included a Canbus Interface. The Canbus Interface wasn’t required for our KTM 990 Adventure installation, but the KTM 1190 Adventure’s ECU is more finicky and the low draw of the LED headlight bulbs (60 watts LED vs. 110 watts Halogen) causes a fault in the system. Cyclops has developed their Canbus Interface to slightly increase the power draw (only 2 watts per bulb) to fool the 1190’s ECU into normal operation. Installing the new headlight bulbs looked a bit intimidating at first because of the many screws holding the plastic side panels together on the KTM 1190 Adventure. But getting the headlight assembly out was actually easier than we thought. Remove the side panel bolts, starting from the front, until you gain access to the two lower bolts holding the headlight mask in place. The KTM 1190 Adventure Owner’s Manual offers detailed instructions for removing the headlight mask in the headlight bulb replacement section and the included Cyclops instructions cover all the details for installing the bulbs. Mounting the Canbus interface was the only tricky part of the installation. The instructions call for drilling four small holes and using rivets to secure the mounting plates. While rivets may be the most secure option, you can safely get away with using a set of small screws with threadlock or lock nuts instead. Swapping out the bulbs in the headlight mask was straightforward and wiring up the lights was completely plug-n-play. The installation can be performed in about 45 minutes and may require readjusting the headlight beam afterward. Detailed instructions for aligning your headlight beam can be found in your owner’s manual. Orange-tinted stock halogen light (left) compared to the bright white LED light (right). The LED bulbs produce more than 2x the power while using 46 watts less than the halogen bulbs. That’s enough power saved to run a heated vest! 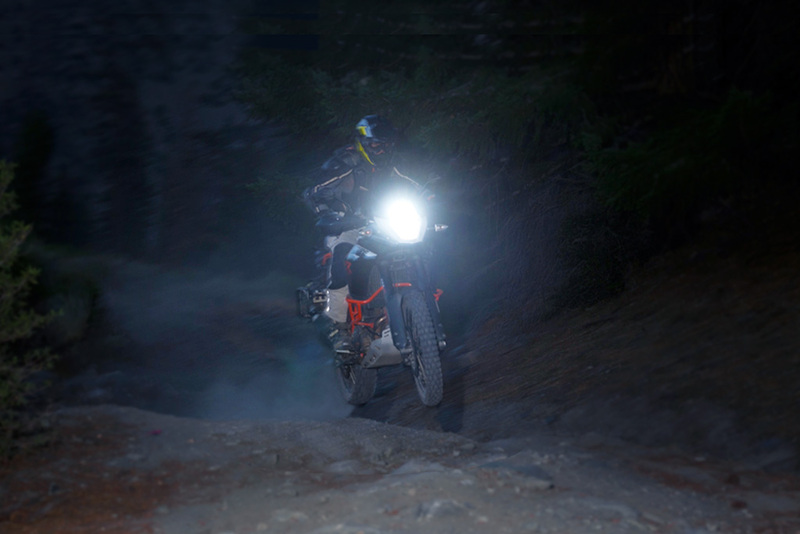 We’ve explored miles of trails with the KTM’s stock halogen headlight setup at night. Like most stock headlights, the lighting is inadequate for any type of performance night riding. Riding at slower speeds is comfortable but when speeds increase, it becomes easy to over ride the light. Riding with the stock halogen light made it more difficult to pick out trail obstacles. The orange tint of the stock halogen lights makes it hard to spot rocks on the trail and reading traction levels is more difficult. Riding on rocky forest trails with the stock lighting can be a nerve-racking experience and leaves you always wanting for more light. Switching to the LED headlight bulbs improved our nighttime visibility significantly. Immediately you notice better lighting directly in front of the bike, far down the trail and along the sides. The white light of the LEDs mimics the color of mid-day sunlight (5700K color temperature) which makes it easier to identify objects in the shadows and you can ride at a faster pace effortlessly. 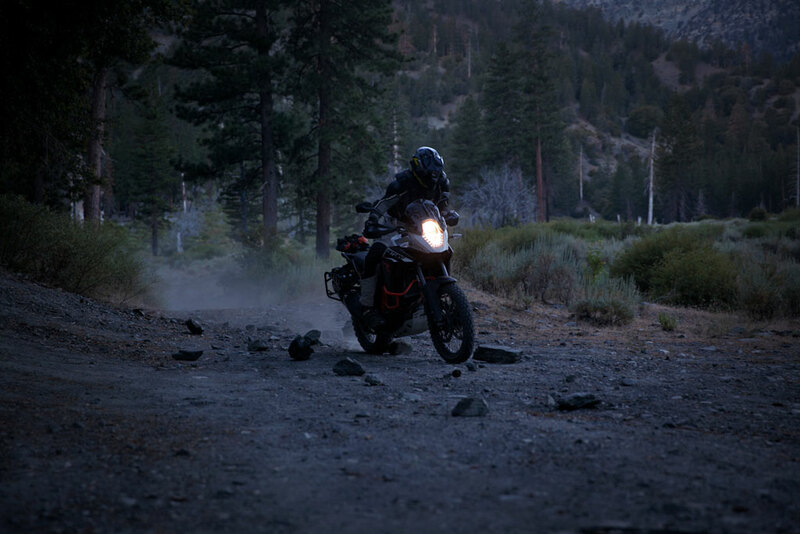 The enhanced lighting gives greater confidence to go faster at night and we’ve had no problems taking the KTM 1190 Adventure on technical trails in the dark. Comparison of the stock low and high beam to the Cyclops LED low and high beam. The high beam on the Cyclops LED headlight is able to light up objects 500 feet (150 meters) away. Night riding through technical terrain at high speeds was an awesome experience with the ultra-bright Cyclops LED headlight bulbs. Back on pavement, the Cyclops high beam lights up back country roads like it’s daytime. While it is designated for off-road use (just like all LED and HID headlight replacement bulbs), the light has a very focused beam pattern similar to the stock halogen headlight and the low beam didn’t cause glare for other motorists when properly aligned. The bright white color of the LED headlight also helps you be more visible in the daylight. So Do You Really Need Auxiliary Lights? If you really want to burn a hole in the night sky or you are racing the Baja 1000, there are some incredibly-bright LED Aux lights on the market. Aux lights are also able to light up the sides of the trail better than a single headlight can and offer some advantages in visibility to other drivers. But when it comes to pure light output, the 6400 lumen LED headlight bulbs are able to illuminate objects as far away as 500 feet (150 meters). That is well within the range of many auxiliary lights on the market and more than enough light for spirited night rides or when the unexpected delay makes riding at night unavoidable. 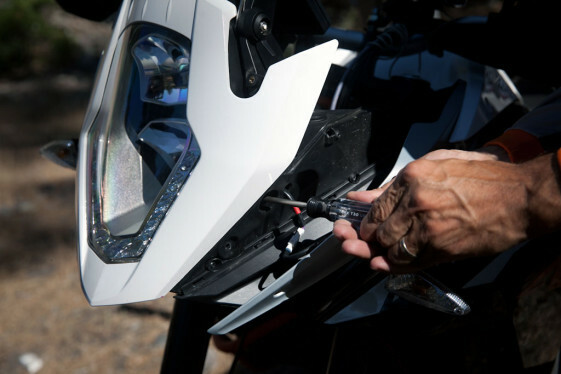 You don’t have to ride a KTM 1190 Adventure to get LED headlight bulbs for your motorcycle. Cyclops Adventure Sports makes LED motorcycle headlights for many different makes and models. There are several dual-headlight-equipped Adventure Motorcycles Cyclops offers replacement LED headlights for with similar light output. Cyclops LED headlight bulb shown here being completely submerged in water while running demonstrates their water resistance. Cyclops Adventure Sports uses 24-hour endurance racing as a test bed for their light development and their LED headlights are all backed by a 12-month warranty. Like all Cyclops LED motorcycle headlights, you can return them for a full refund if you are not 100% satisfied.  Cyclops Long Range: Best Value in High-Output Aux Lights? Just installed this bulb on my DR650 and really can’t believe the difference. I had planned to add aux lights but, for now, they’ll remain in the shipping box. A year and 9000 miles later the bulb is working flawlessly. If there’s one thing to do to improve your riding experience at night this is it. I ride about 50/50, mostly desert. Thanks for sharing your experience Martin. Glad to hear it’s still going strong! Does these LED kit effect the auto light sensor or it will remain as it is? Hi Sharwan. Are you talking about LED daytime running lights on the KTM 1190 Adventure that surround the lower part of the headlight? Those are not effected by the Cyclops LED headlight bulb. does they fit in 2015 ktm super adventure? am I wll be able to ride on normal roads on low beams not blinding other drivers? also, does plastic after while is not gonna turn yellowish? (headlight cover)its diffrent kind of light so im curies. Hi PrzemkO. Yes, the same light kit works with the 1190 Adventure, 1190 Adventure R and 1290 Super Adventure. It should not turn your headlight cover yellow either. It actually runs cooler than a stock halogen bulb. Thanks! Now Im ready to order! I purchased these lights and they are fantastic.I don’t regret my purchase. It was one of the best safety items I have installed on my 1190 adventure. I didn’t have to adjust the beam, just install the bulbs and ride. Seems like a very well made product.